Pity the mullahs who cling to power in Iran. With budding (albeit flawed) democracies to the east and west, with tens of thousands of angry people protesting the tainted election of a figurehead, with web-savvy dissidents informing the world via Twitter, YouTube and Flickr — what’s a frightened theocrat to do? Here’s my favorite image thus far — evoking the lone man facing down the Tiananmen tanks, a woman shakes her fist and waves the green flag of revolution at the advancing riot troops. You go, sister — next thing you know, she’ll be uncovering her head. How is what is happening in Iran not exactly what the Bush administration wanted to happen in Arab regimes? New technology, massive over-reach by the Ahmadinejad forces, emerging women’s voices: these have already precipitated a fracturing of the regime. Set aside the quibble that Iran is Persian rather than Arab — this is indeed exactly the kind of development that President Bush sought to precipitate with the liberation of Iraq and Afghanistan. And it’s great that Sullivan was finally able to set aside his hatred of all things GWB to recognize that. And what achieved this? In a strange way, the messianic radicalism of Bush sustained the messianic radicalism of Ahmadinejad. Obama’s election, as many of us hoped, broke that cycle and allowed for Iran’s opposition to re-emerge without looking like a pawn of the US. The mind reels. Still, Sullivan has been one of the best sources for fresh updates on Iran. 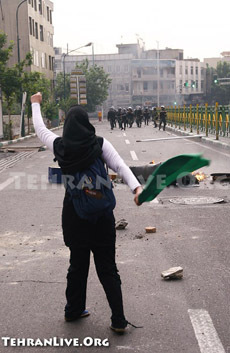 Others are Michael J. Totten, NYT’s The Lede blog and, for photographs, TehranLive.org. This entry was posted in Uncategorized and tagged Andrew Sullivan, Bush, Iran, Islamic Fascism by Kirk Petersen. Bookmark the permalink.